It’s a really humbling experience to live and work among people that are in developing countries and struggling in very basic ways,” notes Asheville resident Cindy Threlkeld, a two-time Peace Corps volunteer. “When you first get started, you think you know — you’re an American, you’re educated, you want to give back. And then you end up moving in and living alongside someone, and you realize that you have a lot to learn about their culture and the way they conduct their lives. I think most volunteers come away saying they received so much more than they gave,” explains Threlkeld, who’s now the executive director of MANNA FoodBank. She’s not alone. Asheville and environs is home to many returned Peace Corps volunteers, who often feel drawn to seek out comparable forms of service stateside. Those who’ve been transformed by the Peace Corps experience often feel they share a deep bond, and a nationwide network of returned volunteers helps them connect with one another, readjust to life back home, and find appropriate ways to continue giving back. The Western North Carolina chapter’s members come together for monthly meetings, shared service opportunities and special events. To celebrate the Peace Corps’ 50th anniversary, the local group is hosting an informational fundraiser Sunday, Sept. 11 at The Grey Eagle (see box, “A Global Party”). Peace Corps volunteers spend two years living and working in a developing country while engaging in cross-cultural exchange. Founded by President Kennedy in 1961 within weeks of his inauguration, the innovative program received 11,000 applications in the first few months alone. Over the past five decades, some 200,000 Peace Corps volunteers have worked in 139 countries, benefiting communities worldwide while enhancing mutual understanding and awareness. Peace Corps projects cover a broad spectrum, including education (37 percent), health (22 percent), business development and information technology (14 percent), environment (13 percent), and other programs (14 percent). 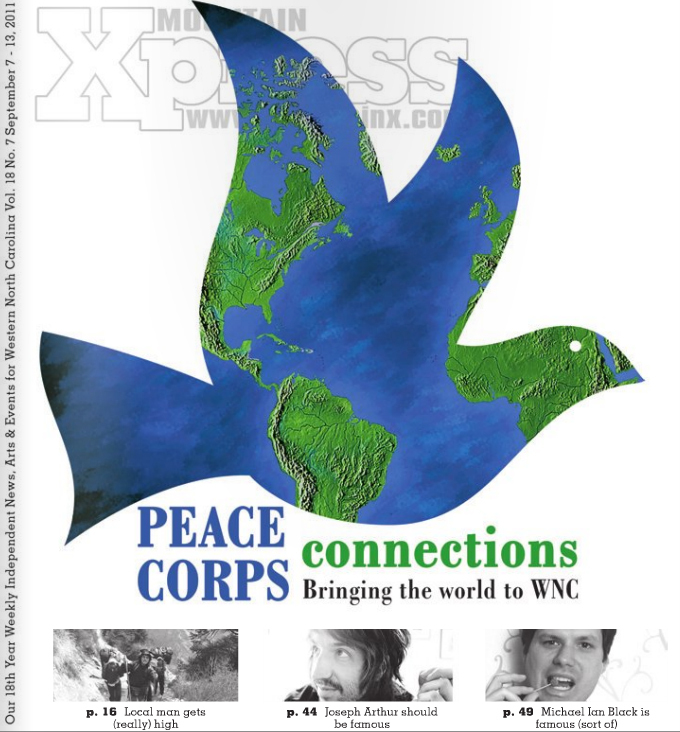 Since 1961, 3,488 North Carolina residents have served as Peace Corps volunteers, and 247 are currently doing so, the organization reports. That knowledge is coming in handy now as Mayer and Brown organize the Asheville 50th-anniversary event. This hands-on, DIY spirit is also evident in the paths many returned volunteers choose to pursue. Asheville resident Chad Conaty was drawn to the nonprofit sector after leaving the Peace Corps. Following stints with the American Red Cross and a hunger-relief foundation, he now works for MemoryCare, which provides support for the families of people with Alzheimer’s disease and other memory disorders. Some volunteers choose to integrate their Peace Corps experience with their formal education. Across the country, 86 colleges and universities offer a master’s degree through the Peace Corps’ Master’s International program. But Appalachian State University in Boone is one of the few with curricula in both education and technology. Students can choose concentrations in renewable energy and appropriate technology — concerns our region shares with some of the developing nations where Peace Corps volunteers work. Many returned volunteers, however, find that one of the most powerful things they can do is share their own experience of living in a developing country, furthering the cultural exchange while increasing awareness of the issues our global neighbors face. Like their military counterparts, those who’ve been through the many highs and lows of serving as a Peace Corps volunteer share a special understanding that often carries over into their subsequent endeavors. In addition, the network can sometimes help reconnect people who knew each other during their years of service overseas. After returning from Zambia, Conaty kept in touch with Threlkeld, who was the Peace Corps’ country director in Africa while he was there. But things took a surprising turn when he decided to move to WNC earlier this year. Both have since gotten involved in the Returned Peace Corps Volunteers of Western North Carolina, enjoying the chance to reconnect while making new friends. Members, says Davis, “come together to do service work.” This fall, for example, they’ll be picking apples at an orchard in Hendersonville to help support MANNA FoodBank. Focusing on North Carolina residents, the group reviews projects posted on the Peace Corps website to decide which one they’ll support. On Sept. 11, the WNC group plans to highlight the many fascinating cultures members have come to know firsthand, sharing photos and stories from their time overseas while celebrating the Peace Corps’ rich history. The cross-cultural affair will feature the Roots Café’s international menu and the global sounds of Free Planet Radio. — To learn more about the Returned Peace Corps Volunteers of Western North Carolina, visit http://wncrpcv.org. Freelance writer Stephanie Guinan lives in Mitchell County. She can be reached at stephguinan@gmail.com. The Returned Peace Corps Volunteers of Western North Carolina invite you to celebrate the 50th anniversary of the Peace Corps Sunday, Sept. 11 from 5 to 8:30 p.m. at The Grey Eagle Music Hall (185 Clingman Ave. in Asheville). Former volunteers will share their experiences; the event will also feature the Roots Café’s cross-cultural fare and the internationally inspired sounds of Free Planet Radio. Tickets ($12 adults; kids 12 and under free) are available at The Grey Eagle, Harvest Records, Orbit DVD, The Outdoor Bird Co. and online (http://www.thegreyeagle.com). Proceeds from the event will be donated to a Peace Corps project involving a volunteer from North Carolina.